In "Bad Medicine" two wealthy old Chicago socialites are murdered, their extravagant gems stolen right out from under their corpses. 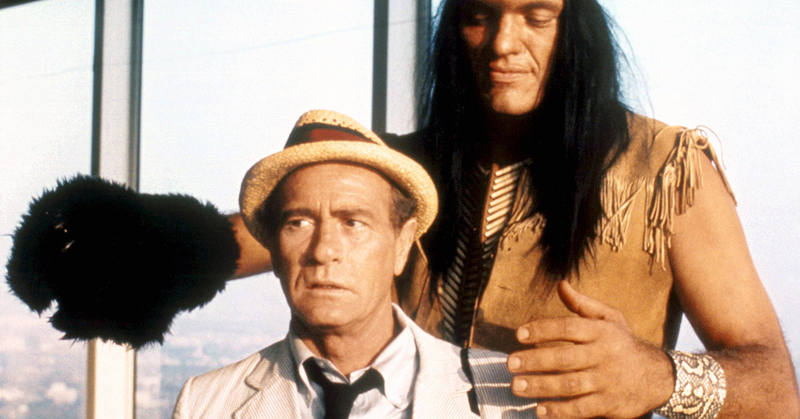 Naturally, Kolchak (Darren McGavin) investigates the crimes. He soon learns of a Native American legend, the Diablero, and suspects that the supernatural being may be stalking Chicago. 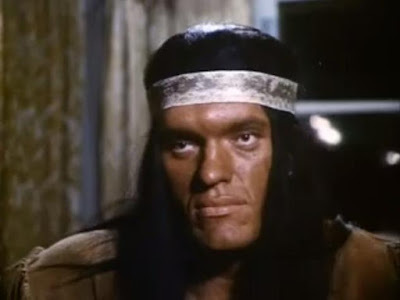 Kolchak explores Native American lore to help find a way to stop the sorcerer, an individual who can "transmute" himself, transforming into an animal such as a crow or a wolf. According to legend, the Diablero is also gathering a fortune in gems, to pay off an eternal curse. He is able to hold his victims in an unbreakable trance. 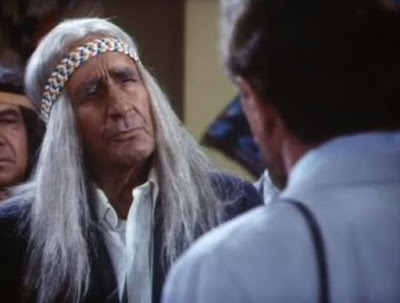 Although "Bad Medicine" treads into some typical cliches of Native American lore on TV (namely the portrayal of such individuals by non-Native Americans), it is nonetheless a fun and worthwhile episode of Kolchak: The Night Stalker (1974-1975). Richard Kiel -- Jaws of The Spy Who Loved Me (1977), Moonraker (1979) -- portrays the monster of the week, a diabolical sorcerer preying on Chicago's wealthy. Kiel's physicality makes him effective in the role, even though he is not relegated to shadows or darkness. In other words, he isn't frightening, but he is creepy. Two scenes mark this episode as especially noteworthy. The first is Kolchak's attempt to break into a gem auction populated by the rich. He fakes his way in to the society event, and then pretends to speak the language of the haves-and-have mores. He is also, amusingly, described as one of the "Hoboken Kolchaks." That's not a high-class sounding lineage, according to this New Jerseyite. The second scene is one closer to the climax, and which perfectly encapsulates Carl's character. He travels alone to Champion Towers, the high ground taken as sanctuary by the Diablero. Kolchak has brought with him a small, hand-held mirror to use to stop the supernatural being. As he approaches the monster, however, he clumsily drops the mirror and it shatters on the floor. Now he has no weapon, and he has signaled his opponent to his presence in his lair. Kolchak is -- as usual -- left to improvise, while experiencing stark, raving terror, as well. Fortunately, Kolchak runs across the accouterments of a bathroom, including a mirror, in the level under construction, and is able to yield a shard of it against the Diablero. 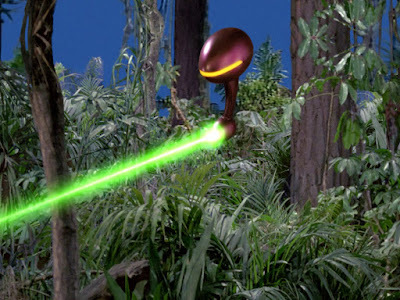 In 2018, the special effects, make-up, and even general pacing of these 1974 episodes render them largely non-scary, and most non-suspenseful. However, the humor and the humanity of Kolchak still shine through. The narratives may leave much to be desired by today's standards, but the idiosyncratic nature of the writing and acting make each installment a treat. Next week: "The Spanish Moss Murders."